If you love farmhouse decor, you are in for a real treat! Here are 10 farmhouse Christmas decor items that can take your home from fun to festive in no time at all! With these amazing items, your home will be ready for the holidays! It’s so easy to fall in love with the farmhouse style. The rustic look, the calming neutral colors, and the way that it fits seamlessly into most homes is absolutely appealing. Combining the holiday vibe with farmhouse style is truly the perfect duo. This holiday season, check out all the amazing farmhouse Christmas tree and farmhouse Christmas stocking options online. There are so many great stores that offer some truly amazing products! 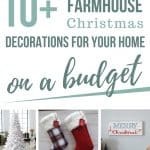 This farmhouse Christmas decor post contains affiliate links, but nothing that I wouldn’t wholeheartedly recommend anyway! Read my full disclosure here. Are you ready to see this Farmhouse Christmas Decor On A Budget? Talk about a beautiful burlap banner that will look perfect about your fireplace! It’s the perfect way to tie in farmhouse Christmas decor throughout the varying rooms of your home! Have you always wanted to have a farmhouse Christmas tree, but never knew quite how to make it happen? This adorable and festive burlap tree skirt will easily turn any regular Christmas tree into one that screams farmhouse. Don’t let your mantle be bare this holiday season! Instead, spruce up the look with these simple and sleek modern farmhouse stockings. They are the perfect size to hold all of those holiday goodies. If you ask me, there are not many other holiday decorations that say farmhouse Christmas decor quite like this beautiful shiplap wooden sign portraying Christmas trees. Handmade and simple to hang, you’ll proudly display this all holiday season! Dream no longer of a white Christmas because this beautiful farmhouse Christmas tree will make all your holiday dreams come true! From top to bottom, your white Christmas is literally covered with this festive Christmas tree. Sometimes, the best Christmas decorations are ones that don’t break the bank and also don’t take up a ton of room, either. These adorable wooden Christmas ornaments are perfect for your farmhouse Christmas tree with the cute little house and barn theme! Create a fun family tradition in your home with this simple, yet elegant advent calendar. You and your loved ones will have a blast counting down the days until Christmas arrives! How cute is this adorable little Merry Christmas sign? 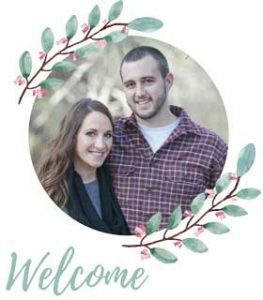 If you are looking for the perfect farmhouse Christmas wooden sign, look no further than this simple beauty! Throw pillows are a great way to decor for the seasons throughout your home. I love the cozy farmhouse style this cute throw pillow brings in! 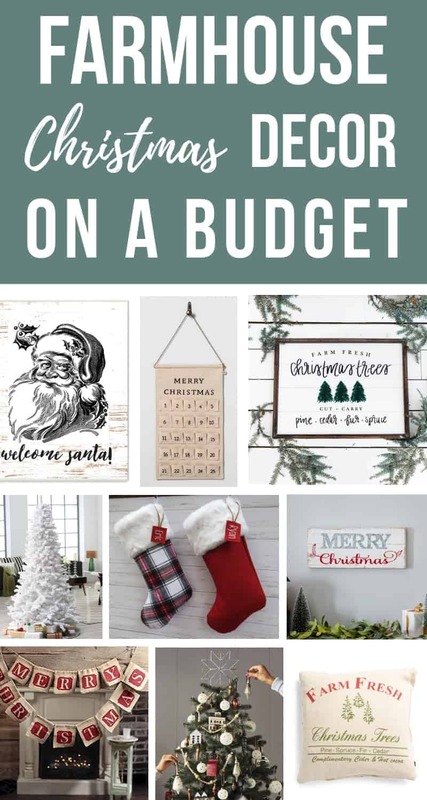 Choose one or choose them all but rest assured that any of this amazing farmhouse Christmas decor items will not only be perfect for your home but also easy on your budget. Affordability is important when it comes to being able to decorate your home for the seasons. With these inexpensive finds, you’ll have no issues decorating your home perfect for the upcoming holiday season! Which of this farmhouse Christmas decor is your favorite? Thanks Chelsea! I found your tutorial video today and it’s JUST what I need to get the holiday spirit cranking this year. Wish me luck!